The 2014 Protected Area Governance and Management Book will be based on IUCN’s very successful compendium text “Managing Protected Areas, A Global Guide” published in 2006 by Earthscan, and will be prepared as a Flagship product for launching at the 2014 IUCN World Park’s Congress. It will also be an integral part of an internationally coordinated approach for the accreditation of tertiary level international protected area management training by IUCN-WCPA. E-Modules of the Book will provide core parts to University level protected area management training. 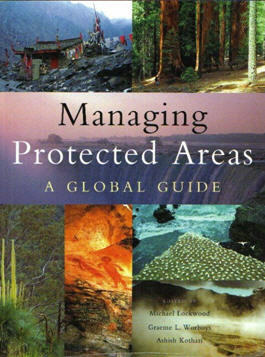 IUCN's 2006 book on managing protected areas. The new Book will incorporate the very best ideas and information provided by the 2006 book. It will also feature the multiple significant advances in protected area management that have been achieved since 2006. It will be completely updated and re-written by the best protected area management professionals and especially members of IUCN’s World Commission on Protected Areas Steering Committee. It will be operationally focused; it will include the very latest and best approaches to on-ground management; and it will feature multiple case studies. All essential, tried and proven management frameworks for protected areas will be included. It will be relevant to protected areas anywhere on Earth. The Book will be used as the information source for students undertaking accredited protected area management training and as such will be available as modules, by chapter. It will be generated in English, Spanish and French and will be available at very low cost. IUCN has an important Mission for protected area management training. It aims to invest in people and specifically the future managers of protected areas by providing access to the best training information on protected area management available. It aims to achieve protected area management competence at the highest levels to underpin effective protected area management. As a consequence, there is a greater chance for achieving the conservation of biodiversity, species and our priceless cultural heritage. The new book is planned to be launched as an IUCN “Legacy Product” of the November 2014 Sydney IUCN World Parks Congress. It will comprise 31 chapters, with each chapter being a self-contained and individually accessible module as well as being integrated as part of a larger book. The book will be available electronically as an E-Book. Every attempt will be made to secure funding so that it may also be also be available in print form for those that do not have access to electronic support equipment. The Book is an integral part of a larger IUCN-WCPA “Protected Areas Capacity Development Programme”. Both initiatives are planned to be launched at the IUCN World Parks Congress in November 2014. The Book will be the principal source of information on protected area governance and management for the IUCN-WCPA professional development program and its content has been comprehensively developed to accommodate this need. The book will help people to be better protected area governance experts and managers. The Book Protected Area Governance and Management will be edited by Dr Graeme Worboys, Dr Michael Lockwood and Ashish Kothari, the same editors that prepared the previous (acclaimed) IUCN compendium text titled “Managing Protected Areas, A Global Guide” published by Earthscan in 2006. Ashish Kothari is the Founder-member of Kalpavriksh (an Indian environmental NGO), former Co-chair of IUCN-TILCEPA and member of WCPA and CEESP Steering Committees. Ashish’s expertise is in conservation governance and community-based conservation. Michael Lockwood is Senior Lecturer, School of Geography and Environmental Studies, University of Tasmania. Michael is the Coordinator for the University of Tasmania’s Protected Area Management Course, he has special expertise in the social sciences and is co-author of co-editor of many protected area related papers and books including the 2010 book “Connectivity Conservation Management, A Global Guide” published by Earthscan. Here is more information about our Editors. Here is a Synopsis of the Book which you can download or view online. A plan has been developed to guide the development of contents of the Book and may be downloaded here (Table of Contents). Newsletters are published with updates about the book project as it progresses. They can be downloaded on our Project Newsletters page.